The National Documentation Centre (EKT/NHRF) is the national institution for the aggregation, documentation and dissemination of S&T information. Founded in 1980, the organization serves the country’s research, education, business communities and the wider public, enabling access to knowledge and facilitating research and innovation (R&I). The organization develops the National Information System for Research and Technology. EKT/NHRF is a strong supporter of open access as a means for social and economic development and is at the forefront of national and international open access initiatives that support the development and implementation of relevant policies for scientific and cultural data, including repositories, peer‐reviewed electronic journals and CRIS. The organization also provides the official RDI indicators to Eurostat and publishes reports on R&D performance in Greece. The rapid increase in the number of mobile users that access the Internet through appropriate portable latest generation devices are creating new needs and requirements in connection with the exploration, delivery and content that is available over the internet. The needs of mobile users in relation to access to sites, repositories, digital libraries and related electronic services lead the EKT/NHRF that is the most important organization for the documentation, preservation of and dissemination of scientific/research content, in searching their satisfaction. Moreover, these needs are perfectly combined with the explosive growth of social networks, in which millions of users share and manage content and spreading it to their networks of contacts and in appropriate groups of interests (interest groups). EKT/NHRF recognizes the importance and dynamics of the trend of social networking and has gradually begun to integrate the strategy in relation to the services it develops and offers. 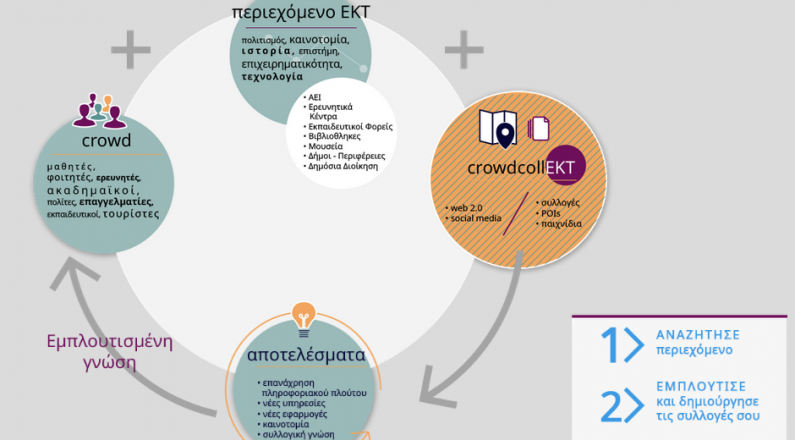 Through the further development of digital infrastructure and content services, much of which is available with open access, as well as the activation of social networks and collaborative content development involving users (crowdsourcing), the CrowdCollEKT platform aims to enhance the quality of research and communication conducted in the academic and scientific world and the exploitation of valid digital content from major categories of users to service priority needs to promote research activity, as long as with the wider use of research results in business, education and lifelong learning. Crowdpolicy designed and developed the CrowdCollEKT platform, providing each user-member of the research and academic community the option to have homogenized access to a set of digital content repositories and incentive models for substantial enrichment institutional content. Single Integrated Search Service for the general public. Integrated Search and Bibliographic References (citations) service for researchers and scientists. Creation and Management of Digital Collections Service. Sharing of content in social networks. Access to the EKT/NHRF and data services to mobile users through their mobile devices, regardless of time and location of the user, as long as there is available internet connection. Providing alternative access channels (mobile devices) to existing users of the EKT/NHRF services (researchers, librarians, scientists, students, etc). Providing value-added services based on the capabilities of handheld devices [such as the automatic recognition of marked items (QR-Codes), the automatic determination of the user’s location (GPS) and contact functions (touch functionalities)]. A typical example is the recovery-disposal service content based on user location (location-aware services). The creation of a first critical mass of users involved in EKT/NHRF services, under the standards of social networks. The attraction of additional number of users and, overall, the increase of users who utilize the services of the EKT/NHRF. The creation of an initial database of applications for portable applications, which will be expanded in the coming years. The acquisition of experience and expertise in relation to the services provision to mobile users.